There's a multitude of caves in India, spread right across the country. Some are natural caves, while others have been astonishingly hand-carved into rock many centuries ago. The caves offer everything from history to spirituality, giving them diverse appeal to all kinds of travelers. Many caves are maintained by the Archeological Survey of India, so do be prepared to pay an admission fee. Here are our favorites. Some are famous but others you may not have heard of. The Ajanta Ellora caves in northern Maharashtra are undoubtedly India's most spectacular rock-cut caves. There are 34 caves at Ellora, dating from the 6th to 11th centuries AD, and 29 caves at Ajanta dating from the 2nd century BC to the 6th century AD. The caves at Ajanta are all Buddhist, while the caves at Ellora are a mixture of Buddhist, Hindu and Jain. The caves were listed as a UNESCO World Heritage Site in 1983. It's absolutely mind-blowing to think how much work must've gone into hand-carving the them! Plan your visit to the caves with this travel guide. If you can't make it to the Ajanta or Ellora caves, the seven ancient rock-cut caves on Elephanta Island, just off the coast of Mumbai, are the next best thing. These caves were listed as a UNESCO World Heritage Site in 1987. Not surprisingly, they're one of the top tourist attractions in Mumbai. The caves have been hand-carved out of rock in a similar manner to the Ajanta and Ellora caves but on a smaller scale. They're believed to have been made during the mid 5th to 6th centuries. The main cave has magnificent sculptured panels depicting the Hindu god of creation and destruction, Lord Shiva. Get there by taking a ferry from the Gateway of India, in Colaba. Do note that the caves are closed on Mondays and boats don't operate during the monsoon season. The cave temples at Badami, in northern Karnataka, are a popular side trip from Hampi. The four main ones date back to the 6th century, during the reign of the Chalukya Empire. They're open daily from dawn until dusk. One cave is dedicated to Lord Shiva, two to Lord Vishnu, and the remaining smaller one is a Jain cave temple. They overlook the 5th century Agastyatirtha Tank and waterside Bhutanatha Temples, which adds to their atmosphere. It's a postcard view! Another cave, with 27 Hindu carvings, was discovered in 2015 not far from the main caves. If you venture around the town and its lanes, you may come across some further ruins of the Chalukya Empire. One of India's Little-Known UNESCO World Heritage Sites, the fascinating Bhimbetka Rock Shelters were discovered by accident in 1957. These rock shelters, of which there are more than 700, are secluded in dense forest at the foothills of the Vindhya mountains about an hour from Bhopal in Madhya Pradesh.What's really remarkable is that they date all the way back to the Paleolithic age and many have tribal rock paintings on them. Meghalaya, in Northeast India, is known for its extensive caves. More than 1,000 of them have been explored! The most accessible cave is Mawsmai, near Cherrapunji (two hours from Shillong). It's maintained as a show cave for tourists and is lit up all the way through. The other caves are more challenging to visit and are suited to caving expeditions with appropriate caving equipment. These include Siju, Mawmluh, Mawsynram, and Liat Prah (the longest cave in India). 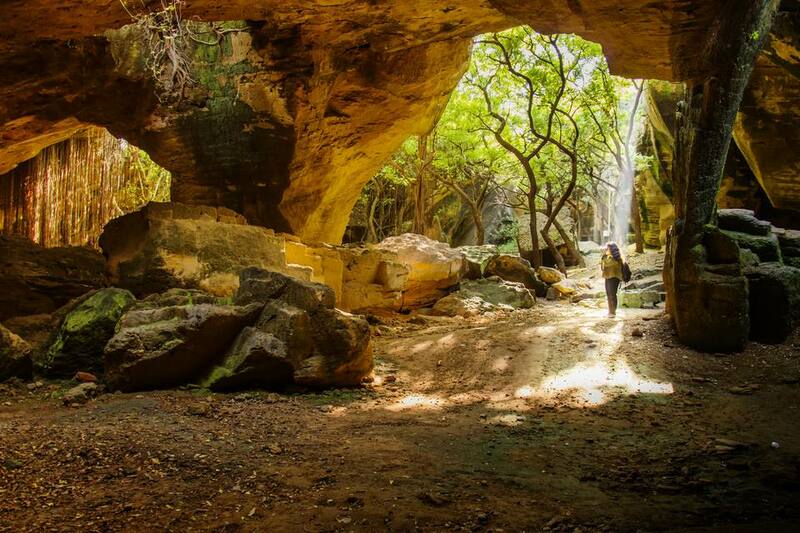 The world's longest sandstone cave, Krem Puri, was also recently discovered and mapped in Meghalaya. Meghalaya Tourism has a list of caves in the state. The Meghalaya Adventurers' Association (email: matours@rediffmail.com) conducts week-long caving expeditions from Shillong. Thrillophilia offers various caving tour packages. Kipepeo also arranges customizable caving trips. The Kailash and Kotumsar caves, in the Bastar region of Chhattisgarh, are also among the longest in India and Asia. These limestone caves extend deep underground inside Kanger Vally National Park, about an hour from Jagdalpur. Kotumsar Cave is the larger of the two. Entry to the caves is regulated by the Forest Department because they're narrow, slippery and dark inside. It's compulsory to take a local tribal guide with you. Only go if you're adventurous and don't suffer from claustrophobia! Do note that the caves are closed during the monsoon season, from June until the end of October, when they fill with water. The spectacular Belum Caves stretch for 3,229 meters (10,594 feet), and are the largest and longest caves open to the public in India. They're part of a wider 1,000 year old cave network that formed from the flow of water underground, resulting in magnificent stalactite and stalagmite structures along their passages. It's believed that Jain and Buddhist monks occupied the caves many centuries ago, and there's even a cavernous mediation area inside. The caves are located in a remote area of Andhra Pradesh, about halfway between Bangalore in Karnataka and Hyderabad in Telangana. Driving time from each city is about six hours. Combine them with a visit to the "Grand Canyon of India" at Gandikota. Although they're not as long, the Borra Caves have similar structures to the Belum Caves and are more popular due to their accessibility. These caves are situated in the Ananthagiri Hills of the Araku Valley near Vizag. The early morning Kirandul Passenger Train runs directly to the caves from Vizag. It's a scenic journey that takes about three hours. Alternatively, it's possible to hire a car for a whole day of sightseeing in the area. Andhra Pradesh also has some well-preserved ancient rock-cut cave temples dating back to the 4th and 5th centuries. Their backdrop of palm trees and rice paddies provides a tranquil contrast to the city of Vijayawada, which they're located near. Inside you'll find shrines dedicated to the all powerful Hindu trinity -- Shiva, Vishnu, and Brahma. However, it's the huge reclining statue of Lord Vishnu on the third floor that really stands out. The Mogalarajapuram (try saying that!) caves, on the east side of Vijayawada, are quite damaged. Yet, they're still interesting. Vijayawada is about an hour and a half from Amaravathi, the new planned capital city of Andhra Pradesh. The rock-caves on twin Udayagiri and Khandagiri hills are one of the top tourist destinations in Bhubaneshwar, the capital of Odisha. They were carved during the reign of Emperor Kharavela in the 1st and 2nd centuries BC for Jain monks to occupy. Cave number 14 (Hathi Gumpha, the elephant cave) has a 17 line inscription that he wrote. In addition to the caves, there's a Jain temple atop Khandagiri. If you climb up the hill, you'll be rewarded with a fine view over the city. Ekamra Walks conducts free guided walking tours of the Khandagiri hills every Saturday morning at 6.30 a.m.
Those who are keen on remote meditation caves in India should consider heading to Tabo, one of the top Buddhist monasteries in India. Situated in the Spiti Valley, in high altitude Himachal Pradesh, the rugged and rocky ridge above the town is filled with caves that the local Buddhist lamas meditate in. There are dozens of caves, both large and small, all dug into the mountain by hand. You can walk up to them and spend some time in quiet contemplation. Have you read Paramahansa Yogananda's iconic book, Autobiography of a Yogi? You can meditate in the cave where Mahavatar Babaji revealed Kriya Yoga to his disciple Lahiri Mahasaya in 1861. The area is still blessed with the presence of Babaji, who is said to have retained his physical form for many centuries. The cave is controlled by the Yogoda Satsanga Society, which was founded by Paramahansa Yogananda and has an ashram in the area. It's opened daily from 11 a.m. to 2 p.m. In addition, Dunagiri Retreat overlooks the cave and is a soulful place to stay. It's possible to trek to the cave through the forest. Jammu and Kashmir has a couple of important cave temples dedicated to Lord Shiva that are popularly visited on pilgrimages. Amarnath temple, one of Hinduism's holiest shrines, contains a Shiv linga that's a stalagmite made out of ice. It's situated high on Mount Amarnath and can only be reached by multi-day trek at certain times of the year. Hundreds of thousands of pilgrims visit it during the annual Amarnath Yatra in July and August. It's much easier to reach Shiv Khori, near Ransoo in the Shivalik Hills northwest of Jammu, although a short trek is still required. Devotees can go about 150 meters inside the cave, where there's a natural stalagmite Shiva linga. A three-day fair takes place at the cave as part of the annual Maha Shivaratri festival in February or March. The Rock Fort temple complex is the focal point of Trichy, one of the top places to see south Indian temples. It was developed by the Nayaks of Madurai on an outcrop 83 meters (237 feet) above the city. Uchi Pillaiyar Temple, dedicated to Ganesh, sits atop it and the panoramic view over town is arresting. However, the Pallavas firstly cut small cave temples closer to the base of the hill, on the south side, in the 6th century. They're known as the Upper Cave Temple and Lower Cave Temple. Unfortunately, entry to the upper one is usually closed off by grilled gates. The Lower Cave Temple has many captivating sculptures and is more striking, albeit somewhat challenging to find. Off-the-beaten-track, Dui Island near Gujarat is home to an evocative labyrinth of light-flecked caves. They're situated just outside Dui Fort, which was built by the Portuguese during their rule of the island in the 16th century. It's thought that the caves may have been excavated by the Portuguese to obtain stone for the fort. Ideally, visit in the middle of the day, when the sun is directly overhead for the best dappled effect. The Barabar Hill Caves are noteworthy for apparently being the oldest surviving rock-cut caves in India. They mostly date back to the time of the Mauryan Dynasty and Emperor Ashoka in the 3rd century BC. There are four caves with rare Hindu and Buddhist scriptures in an enormous long granite rock on Barabar Hill, plus another three caves on nearby Nagarjuni Hill. The curious echo of the caves, from their polished walls, inspired E.M. Forster to use them as a central setting in his book, A Passage To India. They can be visited on a day trip from Bodhgaya. If you're following the Buddhist trail, it's also worth visiting the Dungeshwari cave temples (also known as the Mahakala caves), about 45 minutes from Bodhgaya in Bihar. The Buddha spent a number of years there before making his way to Bodhgaya and finally attaining enlightenment. You'll most likely be invited in to meditate. It's a wonderful spot to enjoy the serenity and spirituality. A large golden Buddha statue in one of the caves is a highlight. These rock-cut Buddhist caves stand out because they're said to have the largest and best preserved prayer hall in India. It's believed to date back to the 1st century BC. There are 15 other caves in the complex that were used as smaller monastery living and prayer spaces. The caves have been hand-caved into a hillside above the village of Karla, about two hours from Mumbai, in Maharashtra. There's another set of caves to the south, at Bhaja. Their architecture is more impressive overall, although Karla has the most impressive single cave. Plan your trip with this Karla Caves travel guide. The Kanheri Buddhist caves are a popular attraction inside Sanjay Gandhi National Park on the northern outskirts of the Mumbai. More than 100 of them, of various sizes, were hand-carved out of volcanic rock from the 1st century BC to the 10th century AD. Kanheri was an important Buddhist settlement and center for learning in western India during that time, and the cave complex is regarded as the largest of its kind in India with the most caves on one hill. The summit provides a fabulous view across the city. The UNESCO World Heritage listed Group of Monuments at Mahabalipuram, near Chennai in South India, has a superb rock-cut Hindu cave temple dedicated to Lord Vishnu. It was constructed in the late 7th century during the reign of the Pallava Dynasty. It features a panel with a carving of Lord Vishnu depicting his third incarnation as Varaha, the boar who lifts Earth Goddess Bhudevi from the ocean. There are more scenes from Hindu mythology carved on other walls. About halfway between Jodhpur and Udaipur, the village of Narlai is an ideal place to take a break from travel explore some hidden caves away from the crowds. The focal point is a cave temple dedicated to Lord Shiva, built where famed Indian sage Narada is said to have meditated. It's cut into a huge granite hill that dominates the landscape and is reached by hiking up through a rock crevice. There are other caves in the hill, plus a marble elephant statue on top. For a luxury heritage experience, stay at 17th century Rawla Narlai. A tough but very scenic three-hour jungle trek from remote Jayanti village, alongside the Jayanti River in Buxa Tiger Reserve, will take you to Mahakal Cave in the hills near the Bhutan border. The natural cave features stalactite formations and is dedicated to Lord Shiva. It's not easy to reach though, as part of the trek is uphill along a steep rocky route. There's a smaller Mahakal cave along the way, which most people don't go beyond. Buxa Tiger Reserve is part of The Dooars plains in northeastern West Bengal. Don't visit during the rainy season (from mid June to October) because the cave is inaccessible then.